“Many years ago something and someone changed my life,” Sister Janelle Athorp explained. The something were statistics that analyzed an individual’s activities during an average 70 year lifetime: 22 years sleeping, 14 years working, 10 years education, 7 years amusement, 5 years eating, 4 years talking, 4 years traveling, 3 years reading, and 1 year miscellaneous. The someone was a Sister who shared with some children how she offered her prayers and work for the glory of God, holiness for herself, and the salvation of souls. During her senior year at Stout State College, Menomonie, WI, Sister Janelle’s classmates began choosing their jobs. “I felt that my life should be given to God’s service, and so I set about to determine which religious community was most suited to my abilities and interests. Since I was a dietetics major, I chose a hospital community,” she said. “My friends, not thinking it a good idea, introduced me to different boys, and in return, I introduced them to some of the Sisters I knew. My family, too, was puzzled when I told them of my decision. I found out many girls are met with opposition before entering the convent. It must be one of God’s ways to strengthen our determination,” she said. So in June 1959, she visited St. Francis Convent to make certain that this was where God wanted her. Sister Rosetta Katherine Schmidt, with whom she had worked for several summers at St. Nicholas Hospital, Sheboygan, WI, was celebrating her jubilee at the Motherhouse, and they made plans for the trip back to Wisconsin. “But on the jubilee day, she was transferred to another hospital, and I went back to Wisconsin alone,” Sister Janelle said. “After that visit, I knew I was entering for Christ and no one else,” she said. The summer flew while her plans materialized. “We bought my trunk and filled it with shoes, books, my flute, and other useful articles. I stopped in the hospital chapel often to ask for courage to make this break. My folks must have received extra graces at that time too, as Mom even agreed to knit a heavy shawl for me. There were the last dress-up affairs, and trips, and picnics, and –then all at once I found myself in a black dress and veil, and a new schedule of activities,” she explained. 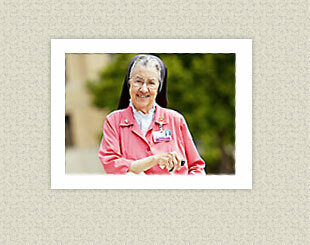 Sister Janelle has served our Community in Food Service in several hospitals. She also served a term as religious leader for our Loretto Home Sisters and presently she volunteers at St. John’s Hospital. Knowing God is never outdone in His generosity, God granted her times with our Sisters in Japan and Germany to assist them in speaking English. “Our God truly is an Awesome God,” she concluded.